Diego Rivera - A revolutionary and troublemaker It was as a revolutionary and troublemaker that Picasso, Dall and Andre Breton described the husband of Frida Kahlo, Diego Rivera, but he was also responsible for creating a public art that was both highly advanced and profoundly accessible. From 1910 Rivera lived in Europe where he absorbed the influence of Cubism. After the Mexican revolution, however, he returned to his homeland and harnessed the lessons of the European avant-garde to the needs of the Mexican people. His own murals, and those of the Mexican Muralists who followed his example, presented a utopian vision of a post-revolutionary Mexico. 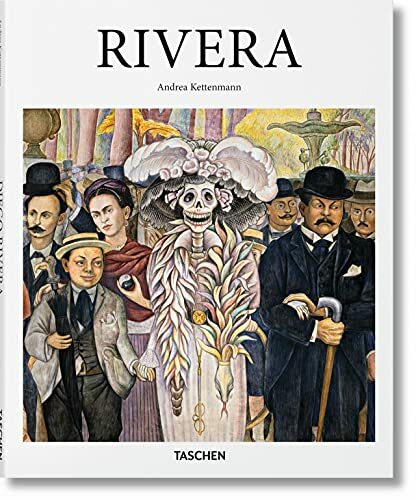 Rivera's historical paintings expressed his interpretation of the revolution and its ideals, in a style that showed him returning to the pre-Columbian roots of Mexican culture, re-inventing a colourfully realistic visual idiom that could appeal directly to a largely illiterate people. This is the first study which, independently of the exhibition circuit, coherently presents the work of this extraordinary artist.